This proportional font system for graphic-LCDs consists of a Bascom-Library, which interprets the font data and draws the characters on the screen. 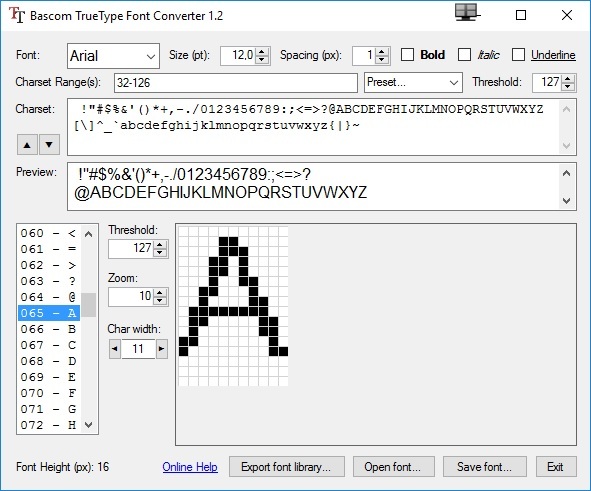 The font data comes in an proprietary format, the font files could be generated with the included TrueType Font Converter. (Controls from left to right, top to bottom) Font properties: Select Font Family, Font size in point (the resulting height in pixels is calculated and displayed at the bottom of the window), font spacing in pixels between each character (ranging from -15 to +15, not visible in the preview) and text styles (bold, italic, underline). Below, single ASCII values and/or ranges of values (separated by , range indicated by -, ex. 32, 33, 65-90) could be entered or select one of the predefined charset ranges. Threshold could be a value from 1 to 254. The charset and preview text is editable as well, the arrow-up button sets the charset needed to draw the preview text, the arrow-down button sets the charset as preview text. Font editor: Choose the character to edit from the list. The conversion threshold could be set for each character individually. In the character drawing area, the left mouse button sets a pixel and the right button clears it. Export library exports the font library in a choosen folder. Open loads a Bascom-include font file, Save exports the font to a include file or a binary file. When launching the stand-alone application, it searches for updates, if available, the application gets replaced by the new version, no installation needed. At least two files need to be included in your application: ProportionalFont.inc containing the font engine and one or more font files (below the End-statement). The previously selected font will be used until another one is loaded, no need to reload the font data every time before drawing a string. The pushed registers are used by the font routine, to support unknown Set-Pixel functions, they are saved as a precaution. If the registers are not used by the Set-Pixel function, the stack-saving could be omitted for speed reasons. fixed RAMPZ getting corrupted when not using XRAM, printing only the first character. Diese Seite wurde zuletzt am 17. Februar 2019 um 12:03 Uhr bearbeitet.